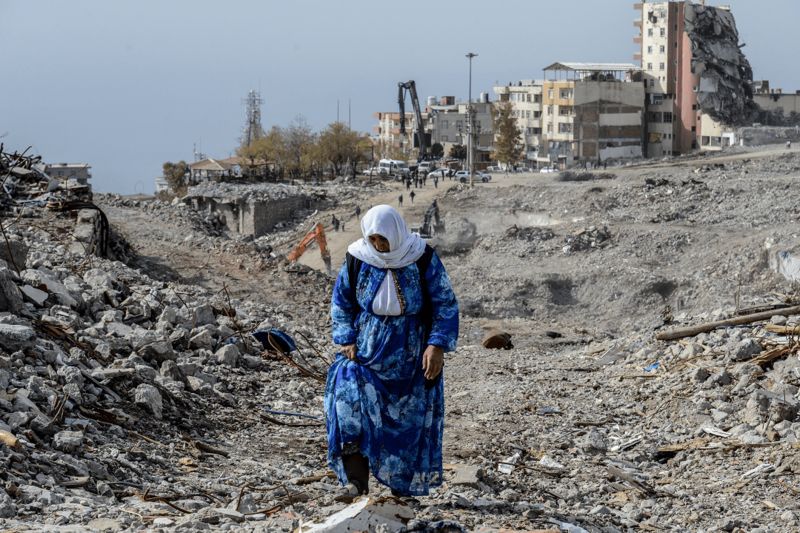 A woman walks through rubble in the provincial centre of Şırnak in November 2016 after it was devastated by the conflict. In July 2015, a two-and-a-half year long ceasefire broke down, and the almost four-decade long conflict between Turkish security forces and militants of the Kurdistan Workers’ Party (PKK) – recognised as a terrorist organisation by Turkey, the U.S. and the EU – entered one of its deadliest chapters in nearly four decades. Since that date, violence has devastated communities in Turkey's majority-Kurdish south east and – at times – struck into the heart of the country's largest metropolitan centres. An unprecedented flare-up of fighting and attacks in some south-eastern urban districts in the first half of 2016, was followed by a gradual shift of violence into rural areas. International Crisis Group has assembled a database of fatalities caused by this conflict since 2011. Our data is based on information available in open sources, including reports from Turkish language media, the Turkish military, local Kurdish rights groups, and the PKK itself. This platform presents some of the information that can be gleaned from this data. For our latest detailed analysis that also draws on this data, click here. Confirmed by Crisis Group as non-combatants, the overwhelming majority of these individuals have been killed in urban clashes in the south east or in PKK bomb attacks in metropolitan centres. (Crisis Group includes only named fatalities confirmed through its open-source methodology). Fatalities include soldiers, police officers and village guards (paramilitary groups comprised of ethnic Kurds, armed and paid by the Turkish state). For a detailed breakdown of state security force fatalities, see below. Individuals aged 16-35 killed in areas of clashes, overwhelmingly in urban curfew zones who cannot be confirmed as either civilians or combatants. These individuals cannot be positively identified as civilians or members of plainclothes PKK youth militias due to the blurred line between civilian and militant in an urban conflict setting. Members of the PKK and affiliates active in Turkey. Crisis Group assumes that total PKK fatalities are higher than this public tally. Ankara says that more than ten thousand militants have been “neutralised” (either killed, captured or surrendered) since the resumption of hostilities in July 2015. Crisis Group figures should not be seen as a refutation of fatality claims made by the Turkish government. See "Methodology and Terminology" section. The fatality rate in Turkey’s PKK conflict peaked in the winter of 2015/2016. At this time, the conflict was concentrated in a number of majority-Kurdish urban districts in Turkey’s south east. In these districts, PKK-backed youth militias had erected barricades and trenches to claim control of territory. Turkish security forces reestablished control in these urban centres in June 2016. While fatalities since July 2015 remained largely confined to provinces in Turkey's south east, the hometowns of security force and PKK militant deaths illustrate the conflict's broader impact on communities around Turkey. Use maps to view fatality rates, dates for provinces and those districts with 100+ fatalities, as well as hometowns (province-level) for state security force and PKK militant deaths. Since July 2015, militant attacks and clashes with the PKK have killed at least 1,144 security force members, including 744 soldiers, 294 police officers, and 105 village guards (paramilitaries comprised by ethnic Kurds armed and funded by the Turkish state). Improvised explosive devices (IEDs) have killed 511 of all state security force members since the end of the ceasefire. An additional 46 were killed by urban snipers, while 88 were killed in attacks involving rocket propelled grenades. All other deaths occurred during militant attacks or clashes which were not described in detail in media reports or official military announcements. The average age of members of the state security forces killed since July 2015 is 29. 99 per cent of security force fatalities were male. At least 464 civilians, and 223 “individuals of unknown affiliation” were killed since July 2015. The names of an additional 42 individuals who were allegedly killed during the urban phase of the conflict have been released by local Kurdish rights groups, but cannot be confirmed through Crisis Group's open-source methodology. These fatalities are recorded as “unconfirmed” deaths by Crisis Group. The death of 2499 PKK militants have been confirmed by Crisis Group since July 2015. Confirmation of militant fatalities is complicated because the PKK often reports the deaths of its members weeks, months, or even years after they are killed in fighting. At least 1,950 members of the People's Defence Force (HPG), the PKK's primary armed wing, have been killed since July 2015. 542 militants of the Civil Protection Units (YPS), a loose network of PKK urban youth militias, and 7 members of the Kurdistan Freedom Falcons (TAK), a PKK affiliate (considered an “offshoot with no operational ties to the PKK” by some researchers) responsible for attacks in western Turkey, were killed over the same time period. 23 per cent of PKK militants (including all of the above groups) killed since July 2015 are female. Following an unprecedented flare-up in south-eastern urban districts toward the end of 2015 and in the first half of 2016, the conflict gradually moved into rural areas. Prior to the 2015 outbreak, this is where fighting has been most concentrated. Crisis Group has recorded fatalities since 2011. Our tally shows that scattered violence continued throughout March 2013 and July 2015. During this time, the PKK had declared a unilateral ceasefire and the Turkish government was in talks with the PKK in what Ankara called a “resolution process”. Visualisation of data related to deadly conflict helps Crisis Group analysts understand its complexity. We believe it can help other advocates, too, as well as policymakers and others directly involved in mitigating the impact of conflict or resolving it. Crisis Group has worked to identify all fatality claims made in the PKK conflict in Turkey since 2011, when it began keeping an open-source fatality database. To ensure accuracy amid a rapid escalation of violence, Crisis Group has also worked to identify the names of all fatalities since July 2015. Only fatalities that can be named are included in the post-July 2015 tally. Names are confirmed through searches of news reports or social media postings for basic biographical data, unique photos, funeral reports and by means of media interviews with the victim's relatives or friends. We do not share the complete source dataset with third parties. Turkey's state security force members are composed of soldiers, police officers and village guards. Crisis Group uses press reports of funerals and official announcements by the Turkish Armed Forces to verify fatalities in this category. In addition to individuals killed in direct clashes with PKK militants, security force deaths include security officials targeted as such, but slain while off duty. Crisis Group does not count traffic accidents, suicides or other non-conflict fatalities unless they are explicitly linked to security operations. Civilian deaths are checked by Crisis Group via reports in Turkish-language press, as well as by reports from local human rights groups, including the Turkish Human Rights Foundation (TIHV) which has a strong track record as dependable sources of named fatalities. Those fatality claims are subsequently confirmed by Crisis Group, which considers an individual a civilian if they can be affirmed as non-combatants by press reports or other sources, if their age or other factors made their participation in armed hostilities unlikely, or/and if they died outside an active conflict zone. The line between civilian and combatant has been blurred by the emergence of plainclothes PKK youth militias in urban areas throughout the south east, in particular between December 2015-June 2016. As a result, some individuals could not be positively identified as civilians, though they also remain unclaimed by the PKK or its affiliates. Crisis Group classifies individuals between the ages of 16 and 35 killed in areas of armed clashes and not identifiable as either civilians or combatants as “individuals of unknown affiliation”. Militants are identified through reports from the Turkish language press or from media outlets directly affiliated with the People's Defense Force (HPG) -- the most active military wing of the PKK in Turkey; the Civil Protection Units (YPS); and the Kurdistan Freedom Falcons (TAK) -- the PKK affiliate (considered an “offshoot with no operational ties to the PKK” by some researchers), all of which release names and biographies of killed militants. Confirmation of militant deaths is limited by the PKK's practice, the reasons for which are unknown, to sometimes announce the names of dead militants weeks, months, or even years after they are killed, adding a delay to the PKK militant fatality count. Turkish officials claim that over 10,000 PKK militants were “neutralised” since July 2015. Crisis Group only counts fatalities which can be confirmed through its open-source methodology, and its numbers should not be seen as a refutation of fatality claims made by the Turkish government. The exact day of death cannot be established for over 100 confirmed fatalities, including civilians, “individuals of unknown affiliation” and PKK militants. These individuals overwhelmingly died in urban areas under prolonged curfews or in remote mountainous regions, and only the week or month of their deaths can be identified by Crisis Group. In the Crisis Group database, their names are added to the last day of each identified week or month.